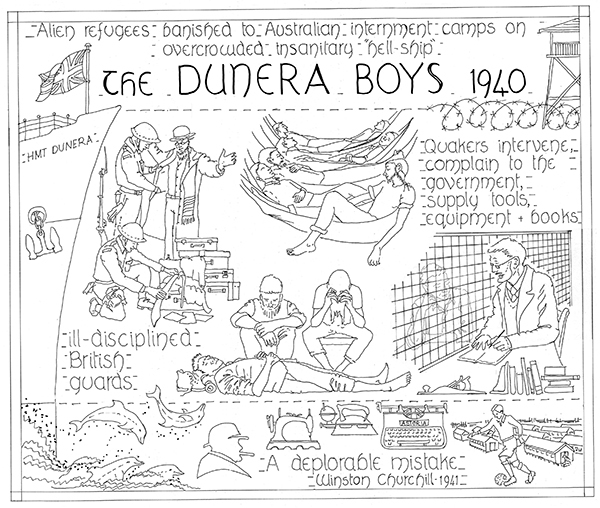 Back in 2015 the Australian Quaker Tapestry project invited us the create a panel about The Dunera Boys. The idea was that the panel be designed and stitched in Kendal. Reciprocating the panel ‘Elizabeth Fry and the Patchwork Quilts’, which the Australian Quakers stitched for us. However ‘The Dunera Boys’ was a not a subject familiar to us. 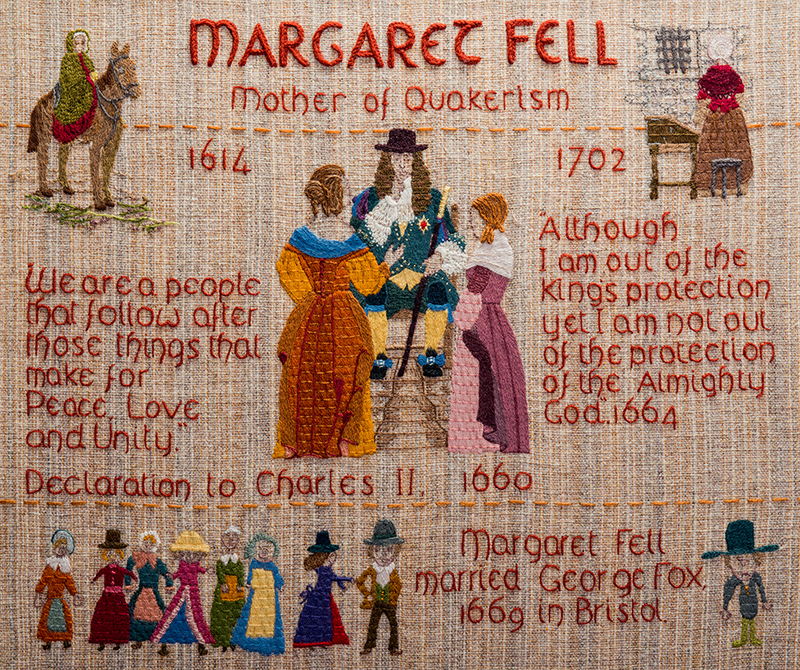 A connection needed to be made to explain the Quaker involvement in the story. How did Quakers respond to the refugee situation? What practical help was put into place and how did they challenge the Governments in the UK and in Australia? So how can such a story be reduced down to a few key images and words? A difficult task but there were strong elements throughout which were destined to became part of the final design. The heading at the top leads viewers into the story. The ship, Dunera, was a floating prison which concealed the brutality administered by the British army guards to the detainees. The panel goes on to show hope and friendship offered by the Quakers in Australia, and later when the story broke in Britain. The two people talking through a mesh screen depicts Quakers talking to internees in the camp and detailed along the bottom of the panel are the tools and books that Quakers gave them to break the monotony; typewriters, books, irons, carpentry tools and shoes to play football. Dolphins in the foreground represent freedom and when it’s stitched the waves beneath them will have lots of colour to reflect the multifaceted parts of who these boys were. 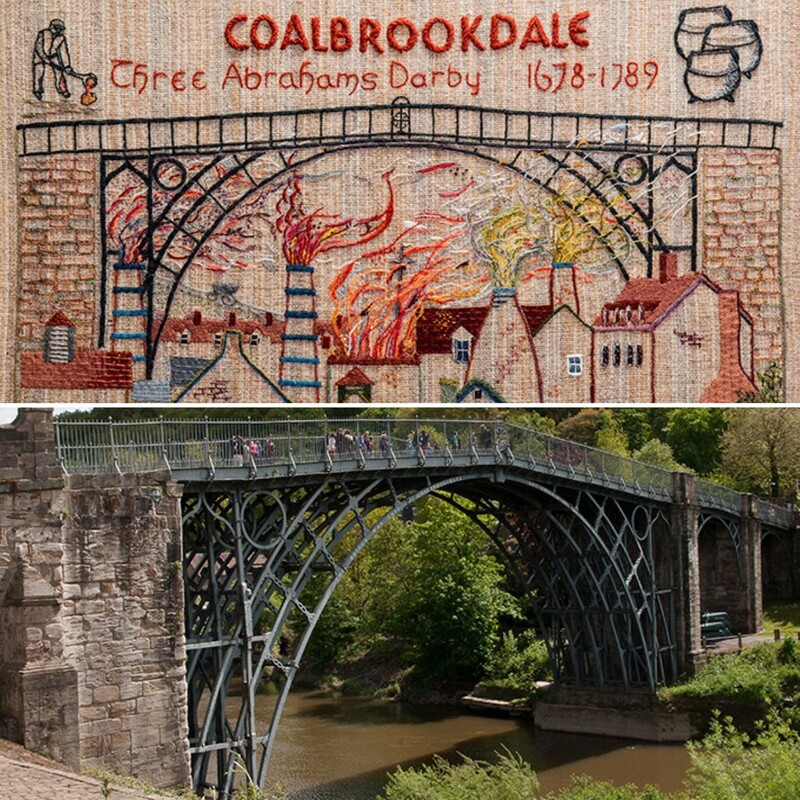 We would like to offer our thanks to Roy for all his hard work in unpicking the story of The Dunera Boys and showing Quaker Tapestry Museum’s dedication in paying true homage to their story in our collaboration with the Australian Quaker Tapestry.